High Peaks Pure Earth has translated a blogpost by Woeser that was originally written for Radio Free Asia on February 4, 2010 and posted on her blog on February 8, 2010. In this blogpost, Woeser refers to another Tibetan female poet and blogger called “Drugmo” who is based in Canada. In the week prior to this blogpost, Woeser had posted three poems by Drugmo on her blog in the original English and Chinese translation. 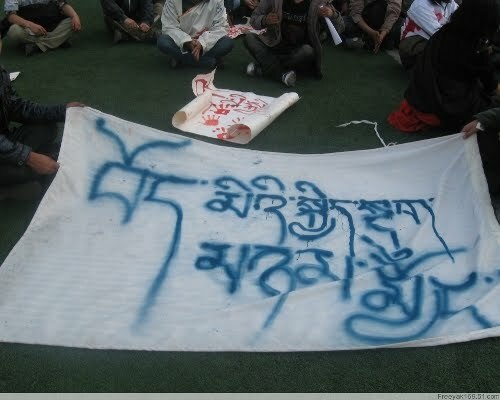 The photo shows Tibet’s fight against violent repression in March 2008.
carrying out a sit-in protest. This morning I was woken up by a phone call from the United States. It was a friend who is currently doing a PhD. Although he is Han Chinese, on Twitter he wrote the following lines: “I cannot possibly choose my descent, but emotionally, I have been Tibetan already for a very long time”. We have been acquainted for many years and after 2008, his humanitarian sympathy for the Tibetan people turned into having the same feeling. On the phone, he was deeply moved by three poems, which I had recently published on my blog. The author of the poems is the young Tibetan woman, Drugmo. I have never actually met her in person, only received her warm greetings on Facebook and she also introduced me to her blog. She has lived in India, Tibet and North America and she uses English to write. Her grasp of the English language and her poetic and literary talent has astounded this Han Chinese friend of mine, he calls her work the utmost enjoyment. Authoritarian people always think that they are invincible. 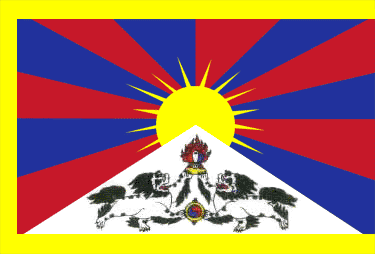 Hence, there are members of the Chinese Communist Party, who are always driven by pernicious behaviour such as “spitting on the ground” or they make a great uproar about “themselves having to thoroughly secularise Tibet, competing with the Dalai Lama for the masses”. Or when facing national and international media, they foolishly ask the Dalai Lama to “clarify calling himself the ‘son of India'”, they preposterously criticise the American President for preparing to meet the Dalai Lama by saying that “first of all, it is unreasonable and second of all, it is unprofitable”. But looking at the so-called “unprofitable” claim, there couldn’t be anything that more vividly sets out how in today’s money-grabbing Chinese society “people recklessly come and leave all for the sake of profit”. Maybe those money-grabbing officials believe that everyone in this world is just like them, blinded by greed, only driven by profit, and completely oblivious to the feelings and treasures of beauty, wisdom, and conscience. To think that “political power grows out of the barrel of a gun” and “money talks” are the only magic formulas that can control the will of the people, this can only be the extremely short-sighted and superficial view of disgraceful and sad materialists. At least, for example because of the resonance of Drugmo’s poems, the fact that among the people, the delusion with regards to authoritarianism has already been dispelled, proves: culture really is a way to resist extinction and being wiped out. 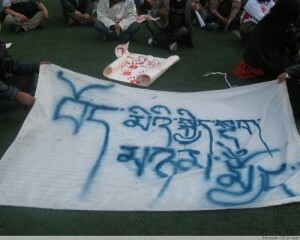 Well, it doesn't really say that they stand together with Tibetans in life and death. Does it? It says that they share their happiness and sorrow. Or am I being too literal? Anyway, it's all about empathy, and it's a lot easier to receive empathy from people who belong to your own culture, your own home language. That's the simpler version of the message I hear here. Thanks for all your translation work. I'm always trying to learn more.